Lou Reed - Transformer. Vinyl LP. Bleep. 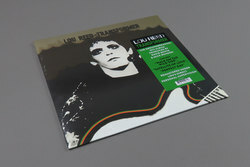 Lou Reeds 1972 LP Transformer was his second solo studio album and the first to contain any new material away from The Velvet Underground. With production duties handled by guitarist Mick Ronson and David Bowie, Transformer is Reed and his brand of New York underground rock at its best. The piece contains revered classics such as the magnificent ballad ‘Perfect Day’ - an ode to Reed’s ailing drug addiction, Warhol and Factory influenced pieces such as ‘Walk On The Wild Side’ and ‘Vicious’, and the previous Velvet’s demo track ‘Satellite Of Love’. Other tracks included are the poetic ‘New York Conversation’ and the raspy ‘Hangin Around’. With each track iconic in its own way, few would argue the classic status of Transformer.